This is another of my bargain finds. In Blue Shoes and Happiness we meet the members of the No. 1 Ladies Detective Agency and this novel by Alexander McCall Smith is the seventh in the series and finds Mma Ramotswe “as she sets out with her usual resolve to solve people’s problems, heal their misfortunes, and untangle the mysteries that make life interesting.” There doesn’t seem to a single, large case in this novel, but rather a series of disconnected storylines. There is a new, too raw advice columnist in the local paper, a Game Preserve manager feels fear spreading among his workers, and a local doctor may be falsifying blood pressure readings. Though very popular based on the positive reviews on Amazon, this wasn’t my cup of tea, though they drank a lot of tea in the story. This article was published on Jul 2, 2018 . 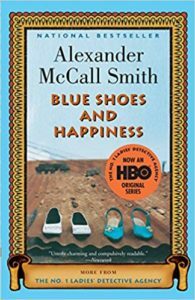 It is tagged alexander mccall smith, blue shoes and happiness. You can follow any responses to this article through the comment RSS feed.